First mentioned in 1304, it weighed 186 carats and was an oval cut stone. It is believed to have once been set in the famous peacock throne of Shah Jehan as one of the peacock’s eyes. Recut in the reign of Queen Victoria, it is among the British Crown Jewels and now weighs 108.93 carats. The largest diamond ever found was 3,106 carats in the rough and originally weighed just under one and a half pounds. 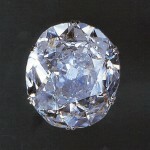 The Cullinan was cut into 9 major stones and 96 smaller stones. 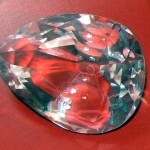 The largest stone cut from the Cullinan and now among the British Crown Jewels. It weighs 530.20 carats and has 74 facets and is still the largest cut diamond in the world. The second largest stone ever found is the Excelsior, which was 995.2 carats in the rough. Some claim that the Braganza is the second largest stone ever found, but there are no records of its existence, and many believe it is mythical — or not even a diamond. The Great Mogul was discovered in the 17th century. The stone was named after Shah Jehan who built the Taj Mahal. The rough is said to have weighed 793 carats. It has now disappeared. The Orloff is thought to have weighed about 300 carats when it was found. At one time it was confused with the Great Mogul, and is now held in the Diamond Treasury of the former Soviet Union in Moscow. One tale told is that the Orloff was set as the eye of a god in the temple of Sri Rangen and was stolen by a French soldier disguised as a Hindu. A flattened pear shaped stone the size of a bantam’s egg, its polished size is 70.20 carats. This is another famous diamond that was once set in the eye of an idol before it was stolen. Legend also has it that it was given as a ransom for Princess Rasheetah by the Sheik of Kashmir to the Sultan of Turkey who had abducted her. A truly historic diamond discovered in 1701 by an Indian slave near Golconda, it weighed 410 carats in the rough. Once owned by William Pitt, the English Prime Minister, it was cut into a cushion shaped brilliant of 140.50 carats and, until it was sold to the Duke of Orleans, Regent of France when Louis XV was a boy in 1717, was called The Pitt. It was then renamed The Regent and set in the crown Louis XV wore at his coronation. After the French revolution, it was owned by Napoleon Bonaparte who set it in the hilt of his sword. It is now on display in the Louvre. More notorious than any other diamond, the Hope was once owned by Louis XIV and was officially designated “the blue diamond of the crown.” Stolen during the French Revolution, it turned up in London in 1830 and was bought by Henry Philip Hope, after whom it is currently named. 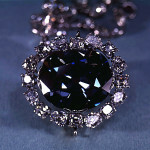 It was while the diamond was in the possession of the Hope family that it acquired its gruesome reputation for bad luck. All his family died in poverty. A similar misfortune befell a later owner, Mr. Edward McLean. It is now in the Smithsonian Institution in Washington. It weighed 55 carats and was cut in a pear shape. It was first owned by Charles the Bold, Duke of Burgundy, who lost it in battle in 1477. The stone is in fact named after a later owner, Seigneur de Sancy, a French Ambassador to Turkey in the late 16th century. He loaned it to the French king, Henry III, who wore it in the cap with which he concealed his baldness. Henry IV of France also borrowed the stone from Sancy, but it was sold in 1664 to James I of England. In 1688, James II, last of the Stuart kings of England, fled with it to Paris. It disappeared during the French Revolution. This pear-shaped 69.42 carat diamond was sold at auction in 1969 with the understanding that it could be named by the buyer. Cartier of New York successfully bid for it and immediately christened it “Cartier.” However, the next day Richard Burton bought the stone for Elizabeth Taylor for an undisclosed sum, renaming it the “Taylor-Burton.” It made its debut at a charity ball in Monaco in mid-November where Miss Taylor wore it as a pendant. In 1978, Elizabeth Taylor announced that she was putting it up for sale and planned to use part of the proceeds to build a hospital in Botswana. Just to inspect the diamond, prospective buyers had to pay $2,500 to cover the cost of showing it. In June 1979, it was sold for nearly $3 million and was last reported to be in Saudi Arabia.